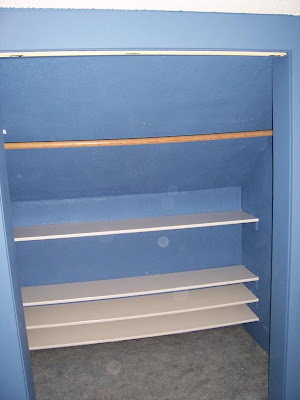 I finally got around to putting up some shelves in the second closet. 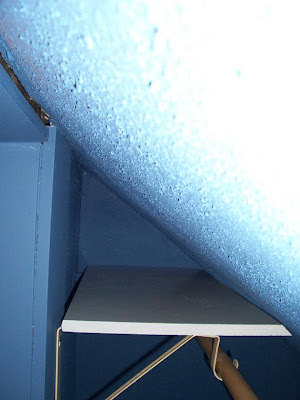 When I started, I was planning on painting the walls a deep red color to match the bedroom, but for several reasons, decided not to – mostly because the popcorn texture stuff flakes off if you barely touch it, so painting would destroy it. Of course, I’d rather not have the texture at all, but removing it would probably require replacing the drywall in the whole closet, which was well beyond the scope of this project. So no painting. Also, I decided to construct only a single shelf in this closet, so it’s not as glorious as the other closet. But I promised pictures, so here they are. It’s still a pretty sweet shelf. Also, this closet also provided some opportunities for interestingly shaped shelves. That’s all for now. Next job: complete bathroom remodel. Mel and I are heading up to Ely for the weekend. Mel wants to talk about quilting with her mom, and I’ll probably watch tv all weekend. 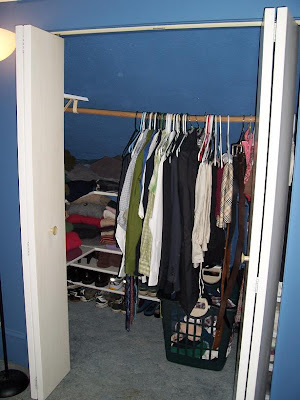 The closet in our Master Bedroom is awkwardly shaped. My project for the past two days has been to construct some shelving in the closet to help us make the most of our limited closet space. 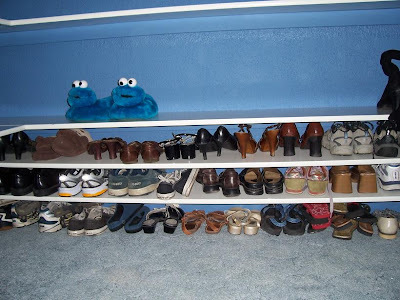 Specifically, I wanted to build something that would accomodate all of our shoes that were previously just tossed in a pile in the bottom of the closet. We’re pretty happy with how it turned out, so I thought I’d share it with everyone. The hardest part was painting the walls blue to match the rest of the bedroom. Mel and I painted the room over a year ago, but never got around to painting the closet to match. 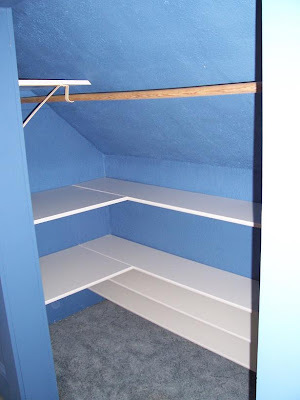 The whole closet has a textured finish that’s hard to paint. Here’s some pictures of the final product. The short shelves on the bottom are specifically for shoes. Here they are all loaded up. The sloping ceiling creates some akward spaces, so I had to be a little inventive to try and make the most of the space. Here’s what it looks like after we get all our stuff in place. Meet the newest member of the Collins household. We call it Kenny (short for Kenmore). 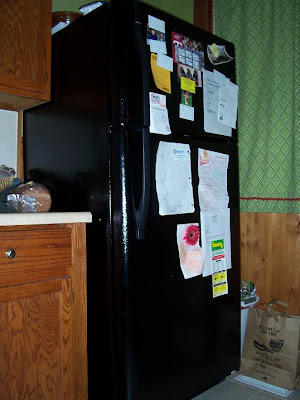 We pooled all of our cash gifts from the wedding and decided we needed a new fridge. Our old one was awful. The shelves were falling down inside and one of them was even totally missing. This one is much better. It’s a little larger than our old one, so it’s still a little imposing in the kitchen, but we’re getting used to it. The best part is that it’s black so it will hide all the dust. We’re only going to wash it once every 5 years.